Designed, patented and manufactured by Saxon, Inc. Peel-A-Deal® is a unique form of coupon promotion in a credit card format that customers love! To use, you simply peel off a prepaid service or discount for a product and redeem. The coupon is then attached to a tracking record or sales receipt to provide accurate redemption rates. The credit card size is convenient to keep in a wallet, or purse, making it easy to use by everyone! Peel-A-Deal® is available in a variety of formats, browse below for details. The Peel-A-Deal® Single Card is the original coupon card that started it all and is the most popular of our Peel-A-Deal® products. The single card size fits neatly into a pocket, wallet or change purse so that your customers will carry it with them at all times! To use, simply peel a sticky back coupon and redeem for stated product or service. The coupon is then attached to a tracking record or sales receipt to provide accurate return on investment information. The Peel-A-Deal® Single Card is available with up to 16 peel-off coupons or a solid back, no peel-off coupon configuration. Single Card Size: 3.3125" x 2"
The Peel-A-Deal® 2-Panel Foldover Card is similar to our Single Card but with 2-Panels available for coupon promotions. Conveniently carried in a pocket, wallet or change purse, your customers can take the Peel-A-Deal® Foldover Card with them wherever they go! To use, simply peel a sticky back coupon and redeem for stated product or service. The coupon is then attached to a tracking record or sales receipt to provide accurate return on investment information. 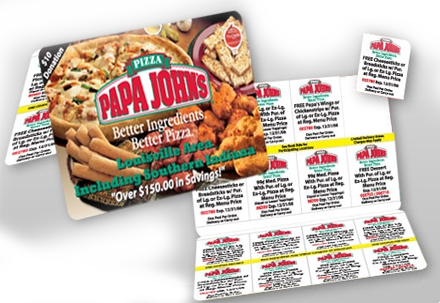 The Peel-A-Deal® 2-Panel Foldover Card is available with up to 16 coupons per panel, or a solid back, no peel-off coupons. Overall Size: 3.375" x 4.25"
2 Panel Card Size: 3.375" x 2.125"
The Peel-A-Deal® 4-Panel Foldover card is the same great product as the Single Card, but with a total of four panels available for coupon promotions. 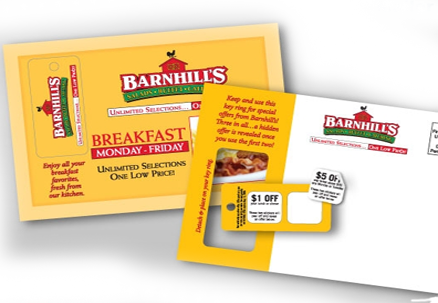 The Peel-A-Deal® 4-Panel Foldover Card is great for promotions and fundraisers with multiple vendors. To use, simply peel a sticky back coupon and redeem for stated product or service. The coupon is then attached to a tracking record or sales receipt to provide accurate return on investment information. 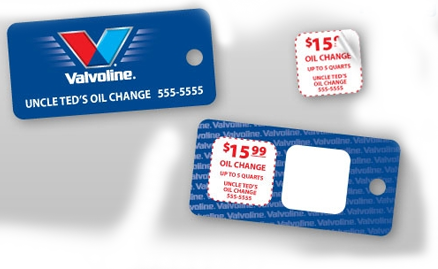 The Peel-A-Deal® 4-Panel Foldover Card is available with up to 16 peel-off coupons per panel, or a solid back, no peel-off coupons. Overall Size: 3.375" x 8.5"
Panel Size: 3.375" x 2.125"
The Peel-A-Deal® 5-Panel Foldover card is the same great product as the Single Card, but with a total of five panels available for coupon promotions. 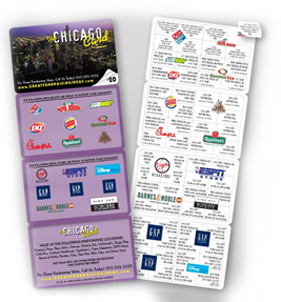 The Peel-A-Deal® 5-Panel Foldover Card is great for promotions and fundraisers with multiple vendors. To use, simply peel a sticky back coupon and redeem for stated product or service. The coupon is then attached to a tracking record or sales receipt to provide accurate return on investment information. The Peel-A-Deal® 5-Panel Foldover Card is available with up to 16 peel-off coupons per panel, or a solid back, no peel-off coupons. Overall Size: 3.375" x 10.625"
The Peel-A-Deal® Postcard & One Piece Mailer is sized for direct mail or newspaper insert applications. This great product is designed to hold the Peel-A-Deal® Single Card securely when in transit, while allowing the customer to easily detach the Single Card from the mailer section with ease. The detached Single Card fits easily into a pocket, wallet or purse! To use, simply peel a sticky back coupon and redeem for stated product or service. The coupon is then attached to a tracking record or sales receipt to provide accurate return on investment information. Postcard Size: 4.25" x 6"
Bulk - One Piece Mailer Size: 4.5" x 6.5"
New Larger Size Mailer or Insert Card: 4.5" x 9"
Peel-A-Deal® Card Size: 3.375" x 2.125"
The Peel-A-Deal® Key Tag coupon card fits securely on a key ring allowing you to carry it with you everywhere. To use, simply peel a sticky back coupon and redeem for stated product or service. The coupon is then attached to a tracking record or sales receipt to provide accurate return on investment information. The Peel-A-Deal® Key Tag is available with one or two coupons, or as a solid back with no peel-off coupons. Key Tag Mailer Stand Up Card (Table Topper) IVM® 1 - Mirror "Hang Tag"
The Peel-A-Deal® Direct Mail card contains a key tag that punches out of the mailer and attaches to your key ring. To use, simply peel a sticky back Peel-A-Deal coupon and redeem for stated product or service. The coupon is then attached to a tracking record or sales receipt to provide accurate return on investment information. 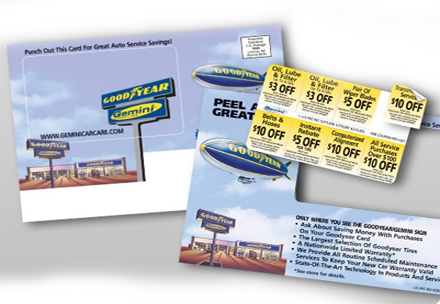 The Peel-A-Deal® Key Tag Mailer card is available with one or two coupons, or as a solid back with no peel-off coupons. 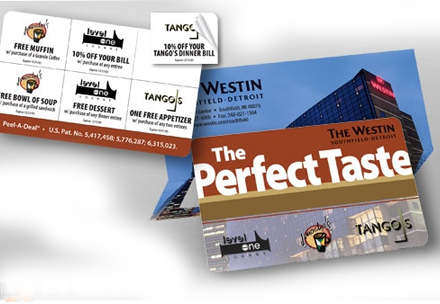 Key Tag Size: 2.375" x 1.125"
Overall Mailer Size: 4.25" x 6"
The Peel-A-Deal® Stand Up (Table Topper) card is easily used for point of sale redemption in hotel rooms, restaurants, bars, clubs and more. Simply remove the Peel-A-Deal® card from the stand-up frame and place in your wallet or purse. To use, simply peel a sticky back coupon and redeem for stated product or service. The coupon is then attached to a tracking record or sales receipt to provide accurate return on investment information. The Peel-A-Deal® Stand Up (Table Top) card is available with up to 8 peel-off coupons, or as a solid back with no peel-off coupons. 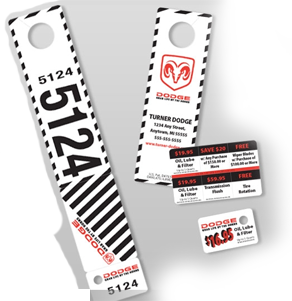 Overall Size: 4.0625" x 3.375"
Card Size: 3.3125" x 2"
IVM - In Vehicle Merchandiser - Mirror "Hang Tag"
Peel-A-Deal® In Vehicle Merchandiser (IVM-1) is a unique form of marketing for automotive dealers. The consecutive number on each tag when hung from the mirror is used to identify a vehicle in for service. 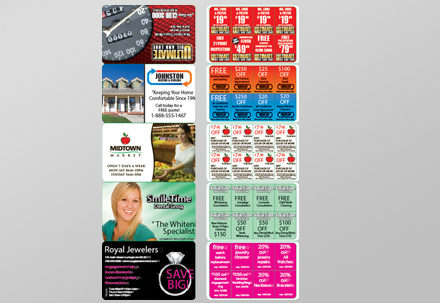 The detachable Peel-A-Deal® card is a marketing tool to promote additional services. The credit card size makes it convenient to keep in the glove box, a wallet or purse. 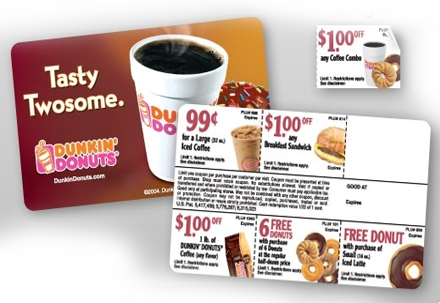 To use, the customer simply peels off a sticky back coupon for stated product or service and redeem. The coupon is then attached to a copy of the sales receipt or tracking record to provide accurate return on investment information. Overall Size: 2.125" x 11.5"
Card Size: 2.125" x 3.375"
Key Tag Size: 2.125" x 1.375"
The Peel-A-Deal® Pull-Off Box Topper card is easy to use for any of your point of sale applications. 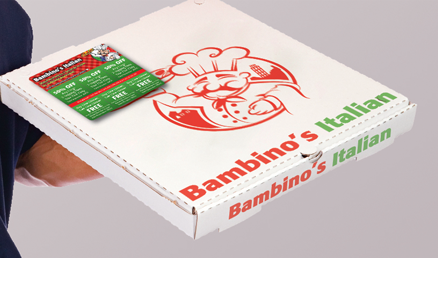 The sticky back strip of adhesive makes it easy to attach the card to pizza boxes, bags and carry out containers. The customer simply separates the Pull-Off Box Topper card from the adhesive strip and places it in their wallet, purse, or saves it in any convenient place for future use. To use, simply peel off a sticky back coupon and redeem for stated product or service. The coupon is then attached to a tracking record or sales receipt to provide accurate return on investment information. Overall Size: 3.375" x 3.125"
Card Size: 3.375" x 2.125"